Born 6 October 1878 at the back of 32 Dollman Street, Aston, Birmingham, Warwickshire [registered as Garaty in Aston, December 1878]. Baptised 23 October 1878 at St. James' the Less, Aston. His baptism confirms his birthdate. According to the 1881 census, William (Garrity) is the third of four children to Frank and Matilda (née Holmes). His father is an engine fitter, they live at 32 Dollman Street in Aston. According to the 1891 census, William has one more younger brother, making him the middle child of five. They live at 5 Bridge (indecipherable) Road in Aston. According to the 1901 census, William, along with seven other footballers, is visiting Blackpool, for they are staying at the Station Hotel on Talbot Road. His family home was at 19 Hall Road in Aston, where he is also stated as being a professional footballer on the census return. He is the third of eight children. His father was a railway engineer. According to the 1911 census, William is now married to Annie, with a daughter, Doris. He is a licensed victualler at Ye Olde Green Man in Bromford Lane in the Erdington area of Aston. 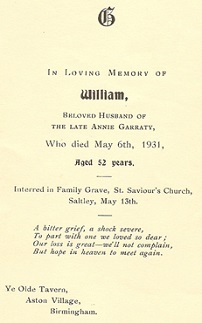 According to Midlands Electoral Records, William and Annie were living at 22 Brookhill Road in Erdington from at least 1920 until his death in 1931. Married: to Annie Shufflebotham, 4 April 1908 at St. Nicholas Church in Kings Norton [registered in Kings Norton, June 1908]. Address stated as 279 Franklin Road, and vocation stated as being a Professional Footballer. Annie lived at 81 Ellesmere Road in Saltley. They went on to have three children, Doris (b.1910), Edith (b.1911) and Marjorie (b.1912). Died: 6 May 1931 at 77 Dudley Road, Birmingham, aged 52 years 212 days [registered in Birmingham North, June 1931], from pneumonia. He was living at 22 Brookhill Road in the town, buried in the family grave at St. Saviors Church in Saltley on 13 May (left). Height/Weight: 5' 9", 12st. 0lbs . Club(s) Played schoolboy football in Birmingham before he played for Highfield Villa FC and Aston Shakespeare FC. Joined his local professional club, Aston Villa FC in 1897. After 225 league matches and 96 goals, he transferred to Leicester Fosse FC on 7 September 1908 and to West Bromwich Albion FC on 30 October 1908. Garraty joined Lincoln City AFC on 23 November 1910, being permitted to remain living in Birmingham. Retired in 1911. Player number One of three who became the 285th players (285) to appear for England. Only match No. 85, 2 March 1903, England 2 Wales 1, a British Championship match at Fratton Park, Frogmore Road, Southsea, Portsmouth, aged 24 years 147 days. "FOOTBALLER'S PECULIAR TRAINING - William Garraty, the Aston Villa and International forward, and two other Birmingham men, were summoned at the Coleshill Police Court on Wednesday for poaching on Lord Aylesford's estates. The offence alleged took place on the 3rd inst., the statement being that defendants spent many Sunday afternoons poaching in the district. Garraty denied the offence and said he was merely walking out to keep himslef in condition. The defendants were fined 20s. and costs." - The Coventry Herald and Free Press, 22 July 1904. From 1913 until 1931, worked as a drayman (driver) at Ansell's Brewery. He was still a drayman at the time of his death. - An English Football Internationalists' Who's Who. Douglas Lamming (1990). Hatton Press, p.104/5.